Protect: The Office of Planning & Development commits to protecting the health, safety and general welfare of Iowa County’s citizens and to protect the county’s natural resources through the equitable enforcement and administration of land use codes and ordinances. Plan: The Office of Planning & Development commits to providing professional planning techniques and services, including the integration of mapping with multiple layers of data (visit the GIS website), and to assist local jurisdictions in creating, supplementing and updating comprehensive plans that outline the vision, goals and values of Iowa County’s citizens. Educate: The Office of Planning & Development commits to providing opportunities for the public to become aware, understanding of and involved in solutions to all land use related issues that may impact Iowa County’s physical environment and the quality of life of its citizens. Serve: The Office of Planning & Development commits to maintaining a focus on serving the interests of the Iowa County citizenry through continual staff development and training with the goal of increasing competency, public trust and stewardship of the public trust. The decrease in permits since 2016 reflect the resolution of the 2015 orthophoto violations. 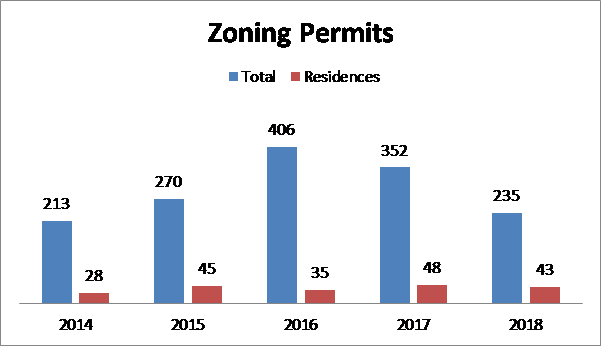 There were 146 zoning permits issued between 2016 and 2017 related to the 2015 violation project. These are self-reported values provided by the applicant. The reported project value related to the 2015 orthophoto violatino project totaled $1,553,231. 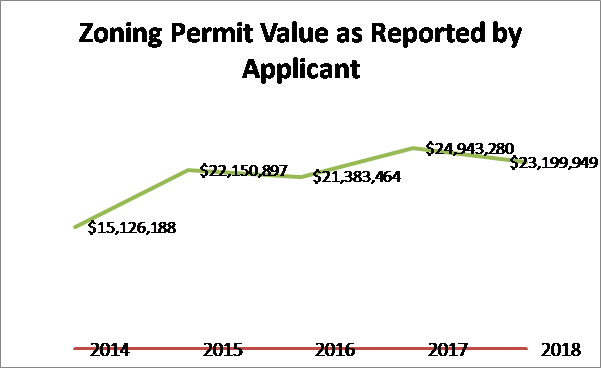 The decrease in recorded soil tests reflects a policy change where a soil test is no longer required as part of a rezoning application. 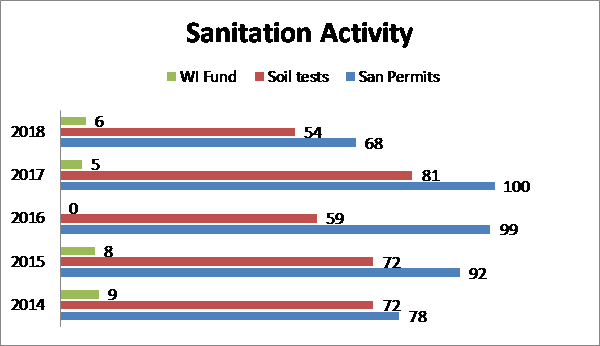 The decrease in sanitary permits reflects a decrease in failed systems compared to past years. 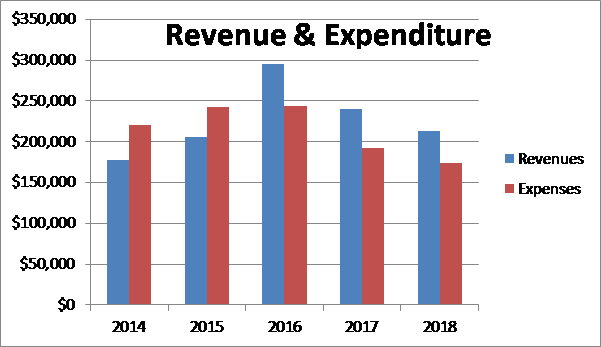 These figures do not include the GIS data which are tracked separately. The floodplain ordinance was revised to incorporate dam breach studies having the impact of zoning those areas as floodway. This prevents development in those areas and lowers the hazard rating of the county-owned dams. The shoreland zoning ordinance was revised to be consistent with 2017 WI Act 68. 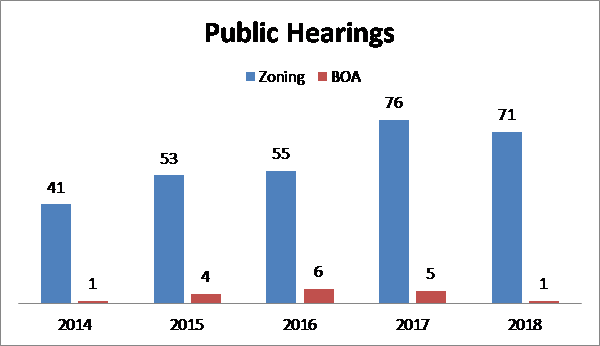 The zoning ordinance was revised to be consistent with 2017 WI Act 67 and 2017 WI Act 68. The process of revising the airport zoning ordinance in collaboration with the Airport Commission and Highway Department begun and is anticipated to end in 2019. The process of reviewing the manure storage ordinance in collaboration with the Land Conservation Department begun and is anticipated to be completed in 2019. The process of reviewing kennel regulations in the zoning ordinance began and is anticipated to be completed in 2019. The incorporation of the RH-1 Rural Hamlet zoning district into the zoning ordinance was completed. Two new mine sites were permitted, giving a total of 27 permitted sites in the county. Onsite inspections were made for each of the permitted mines for the required annual reporting. This is an opportunity for staff to work with mine operators in determining active mining acres, reclamation status and anticipated expansions. Of the 1500 private septic system maintenance notices sent for this year’s cycle, only 17 citations had to be issued for failure to submit the required maintenance report. The filing deadline was extended twice due to the unusually wet summer. There are about 6,500 private systems in Iowa County. Inspections were made on the installation of 57 septic systems, of which 8 were hold-overs from last year. This year’s abnormally wet summer made it very difficult to get systems installed. 29 systems that were permitted this year could not go in due to the weather and plan to be installed in 2019. Staff presented in a regional workshop for continuing education for plumbers and soil testers. There were 33 violations investigated in 2018. Of these, 23 or 70% have been resolved by staff assisting property owners to achieve compliance versus issuing citations. An additional 35 violations were closed dating back to 2014. One citation was issued for a violation unresolved since 2017 due to the landowners failing to respond to correspondences. A guilt ruling was pronounced and the defendants have failed to pay the judgement. Additional citations will be issued until compliance is achieved. There are 22 open violation cases dating back to 2013, out of a total of 412 cases during the same timeframe. This is an 95% closure rate. Updated the Public Land Survey System layer with hundreds of contracted section corner coordinates. Staff worked with the towns of Brigham, Dodgeville and Ridgeway in reviewing their respective comprehensive plans. 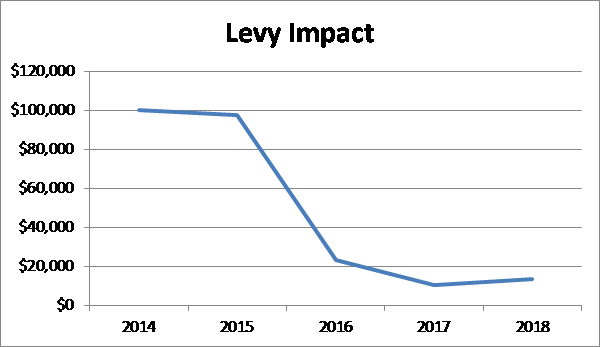 As a result, revisions to the Iowa County Comprehensive Plan are anticipated in 2019. Started collaboration with the Unified Community Services Director to comply with 2018 WI Act 184, which mandates the county to find housing for supervised release of sexually violent persons. The role of this office will be to provide mapping to locate potential housing sites that comply with minimum setbacks to sites, such as parks, schools, churches, etc. Staff worked with the Wisconsin Counties Association, Wisconsin Onsite Water Recycling Association and Rep. Kathy Bernier’s Office to create legislation to close a loophole for religious exemptions from private septic systems. Please feel free to find out more about what we do by contacting us or stopping in. We’re always open to questions and suggestions.